The DEWALT DWAFV0514 FLEXVOLT 5-1/4 inch Carbide Wood Hole Saw Blades are engineered to maximize runtime. It offers carbide teeth for long life, and a thin kerf design for high efficiency. For use in cordless and corded tools. DEWALT FLEXVOLT High Efficiency Accessories are engineered to Maximize Runtime. The hole saws feature a self-feed pilot bit for fast, efficient cutting, carbide teeth for long life, and a thin kerf design for high efficiency. For use in cordless and corded tools. The DEWALT DWAFV0358 Hole Saw is 3-5/8inches in diameter. he DEWALT DWAFV0400 FLEXVOLT 4 inch Carbide Wood Hole Saw Blades are engineered to maximize runtime. It offers carbide teeth for long life, and a thin kerf design for high efficiency. For use in cordless and corded tools. he DEWALT DWAFV07SET FLEXVOLT 7 pc Carbide Wood Drilling Hole Saw Kit is engineered to maximize runtime. The hole saws feature a self-feed pilot bit for fast, efficient cutting. It offers carbide teeth for long life, and a thin kerf design for high efficiency. It also has self-feed pilot bits for fast, efficient cutting, along with spring-loaded collar that automatically engages drive pins to prevent hole saws from locking to the mandrel. For use in cordless and corded tools. Includes (3) Hole saws: 2-1/8", 2-9/16", 3-5/8", (1) Quick Change Mandrel, (3) Self-Feed Pilot Bits. 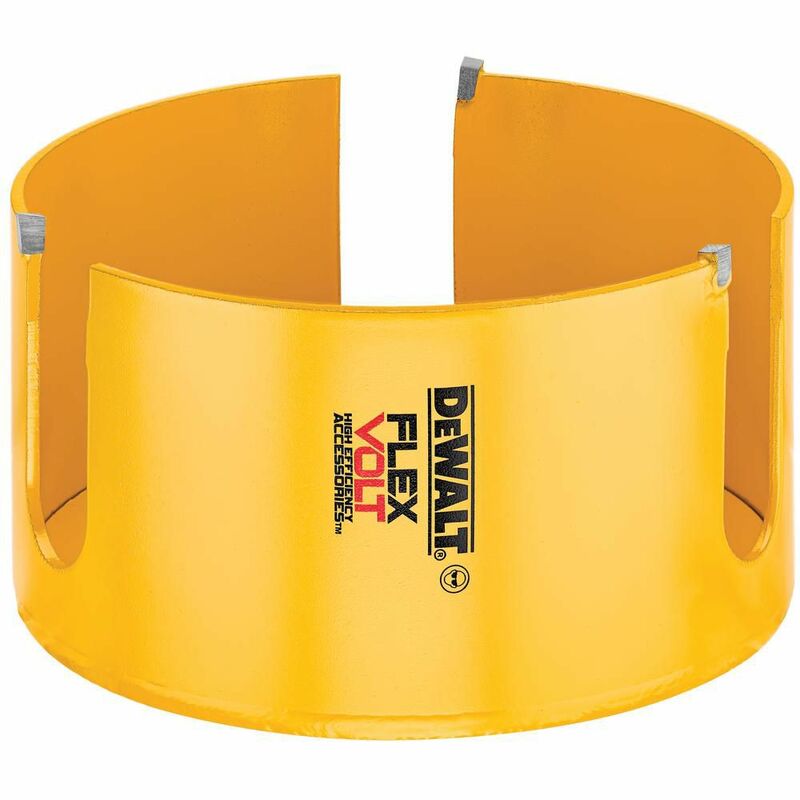 FLEXVOLT 5-1/8 Inch Carbide Wood Hole Saw The DEWALT DWAFV0514 FLEXVOLT 5-1/4 inch Carbide Wood Hole Saw Blades are engineered to maximize runtime. It offers carbide teeth for long life, and a thin kerf design for high efficiency. For use in cordless and corded tools. FLEXVOLT 5-1/8 Inch Carbide Wood Hole Saw is rated 1.5 out of 5 by 2. Rated 1 out of 5 by Richard from Completely unsatisfactory result. The carbide tips were not sharp.... Completely unsatisfactory result. The carbide tips were not sharp. I used it five times on five different types of wood, and in each time rather than cutting, it chewed its way thru, leaving a very rough chewed surface that required extensive clean up. My old bimetal hole saw did a much better job. I am taking it back to my local Home Depot to return it as it is still within the 30 day period. My only recommendation is 'do not buy it'. By the way, the arbor spade bit that is needed to work with this hole saw was just as bad. It appeared never to have been sharpened. The first two times I tried to use it with the hole saw, it literally pulled the spindle out of my drill press! Twice. I replaced it with a normal drill bit and was able to at least try to use the dull hole saw. Rated 2 out of 5 by DJ from Most of my tools are made by Dewalt, but this product did not work as expected. It jamed repeated... Most of my tools are made by Dewalt, but this product did not work as expected. It jamed repeatedly, our company kept it and ordered another whole saw just to make sure it wasn't my Dewalt impact. After the off brand cut through the wood we realized that the flexvolt 5 1/4 did not cut as expected. Maybe it could have been defective.